I Am Not Afraid To Lift Workshop is Coming to FUELhouse! $199 Early Bird Ends May 19- SIGN UP NOW! Women's Strength Workshop to help women learn to lift and to feel empowered through strength training. This workshop is appropriate for women who lift at ALL levels, from beginners to advanced lifters. From those women who have never lifted weights before who want to learn the basics of a push-up or how to achieve their first unassisted pull-up, and for those advanced lifters who want to take their training to the next level by improving program design or by learning new techniques to work towards a specific strength goal such as a weighted pull-up, a new 1 rep max for barbell deadlift, or a max bodyweight press. This workshop will help you to sharpen skills and learn programming in order to reach your goal. The importance and benefits of strength training, why being strong trumps the scale and being “toned”, plus my "3 E System" to EMPOWERMENT. I Am Not Afraid To Lift® is a registered trademark. 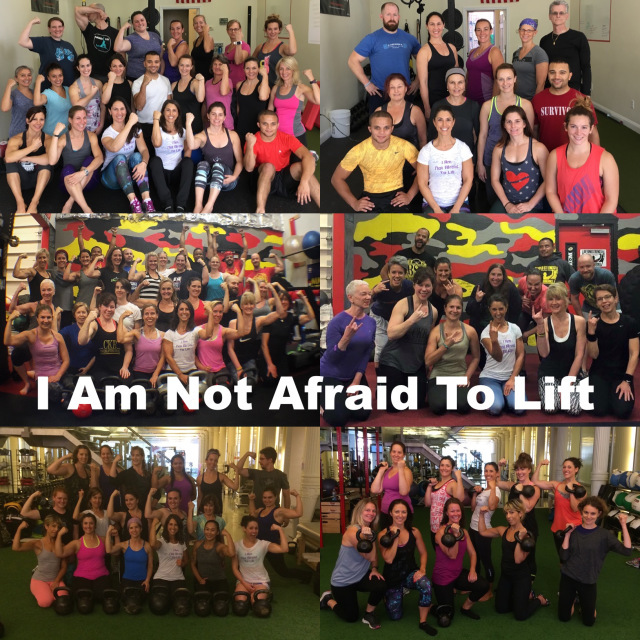 In 2014, I created my women’s strength workshop I Am Not Afraid To Lift®. I created this workshop based upon how strength training strengthened and changed both my body and my mindset and based upon my experience training for the strength challenge, the Iron Maiden Challenge (video below). I can assure you ladies, strength training will not make you look less feminine and your lady parts will remain intact. After teaching my women’s strength workshop I Am Not Afraid To Lift® all over the United States and even around the world in Australia, I took a one year hiatus from teaching the workshop in 2017 in order to re-vamp the curriculum. The brand new 2018 curriculum now also includes barbell lifts in addition to kettlebell lifts. After registering for the workshop, I will send each registrant a questionnaire in order to gauge what level they are at e.g. beginner lifter vs. advanced lifter. I will also send each registrant a detailed agenda. Read testimonials and watch footage from past workshops HERE! Contact me at IronBodyByArtemis@gmail.com if you have questions or need more detailed information and I look forward to lifting with you!! Posted on April 9, 2019 by Molly Kieland and tagged imnotafraidtolift ironbyartemis fuelhouse kettlebells barbells bodyweight.